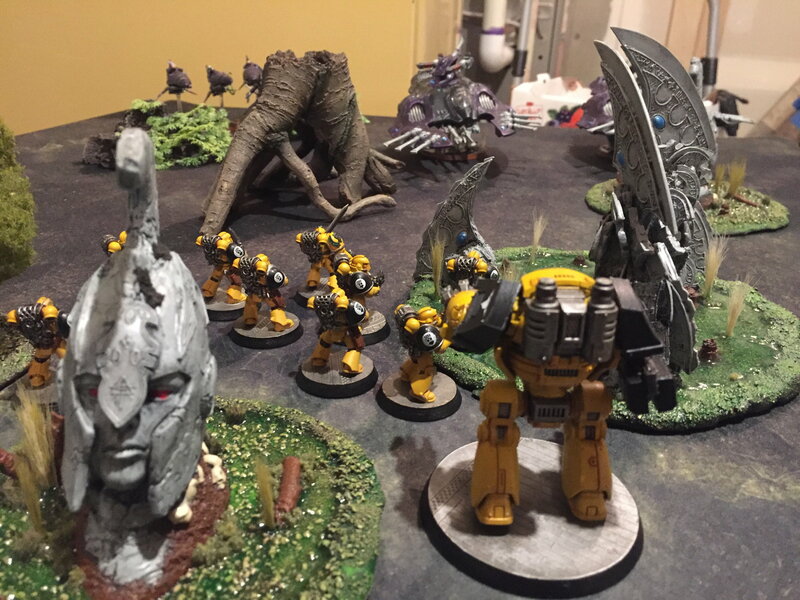 Playing on some tables at the local club recently that are the classic painted gravel style has reminded me that game mats changed everything – no more skinned knuckles or chipped Sisters of Battle. The Frontline/TableWar F.A.T. 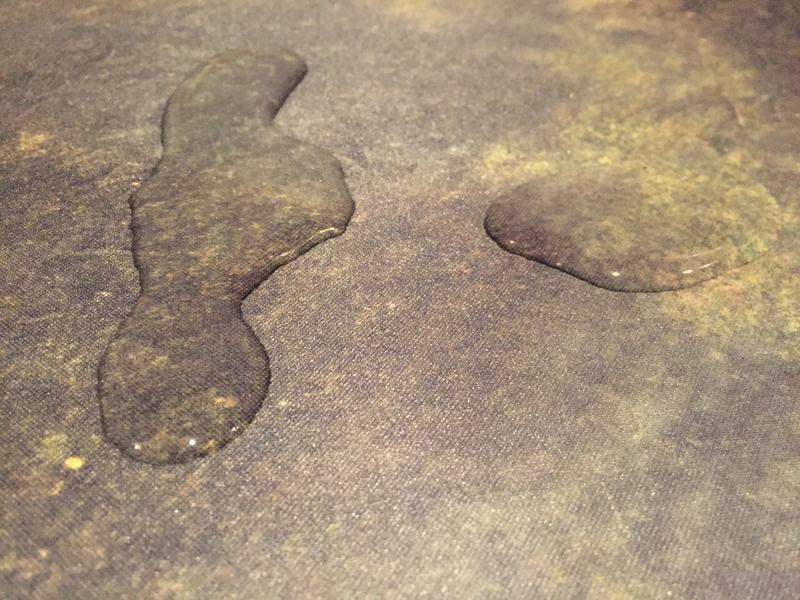 Mat kicked off a new era – high resolution graphics, a mat that could make any surface one you could game on (important in a small one bedroom apartment), a nice texture…my review of the original mat is here, and my opinion remains just as glowing. But Frontline and TableWar have parted ways, with TableWar keeping the original branding and designs, and Frontline rolling out a new series. So how is Frontline doing at flying solo? First, a disclaimer: Frontline has generously sponsored Variance Hammer contests before, and provided the mat used in this review free of charge. I’m of the opinion that you can never have too much themed terrain. Terrain, bases, etc. make the game – and now that we’ve moved from the goblin green felt surfaces of the past, I think themed mats go along with that. They add texture and interest to a board – which means the quality of designs and variety are both important. Frontline game out swinging with a huge array of mats. Some of them are, admittedly, recolors (War-torn Cobblestone City, Snow Covered, and War-torn Snow Covered are…conspicuously similar). They also range from the reasonably generic backdrop (Swamp, Tundra, Badlands, etc.) to maps with some structure in them – for example, most of their city maps have a somewhat irregular street pattern that will, especially for narrative games, prompt where you put terrain. That may annoy some players though, as putting a building across a road due to, for example, a tournament’s terrain layout guides will look weird. Personally, I like that kind of structure. 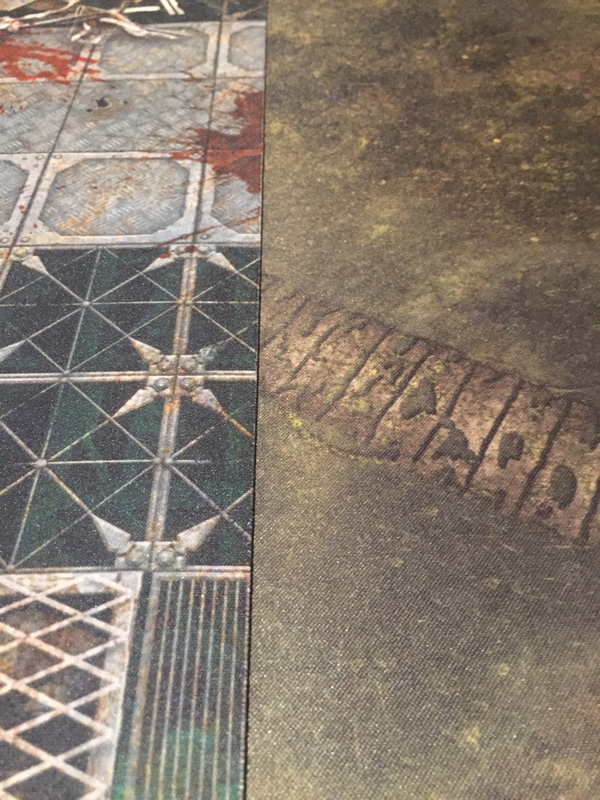 I think Frontline manages to thread the needle fairly well – they’ve got some interest built into the mats, but not so much as the Gamemat.eu mat I reviewed previously, which felt more like some of their designs will really dictate how you layout your terrain. They’ve also got official Privateer Press mats if that’s your thing. The one I’ll be reviewing today is their Swamp mat, because it’s been bothering me awhile that I don’t have a map to go with my swamp-based Eldar. First off, and thankfully, everyone has moved away from the tyvek-esq tube that the original F.A.T. Mats from the Kickstarter came with. Those cases just weren’t good. The current case comes with a black cloth case, helpfully including a luggage tag with the design and size of the mat within. Not a big deal if you’ve got a single mat, but at the moment I’m up to four (…what?) and it’s useful. I imagine if you’re a tournament organizer or run a store, and so are dealing with dozens of these things, it’s especially helpful. From the classic “three foot” standard, both mats look great, and the graphics come out as crisp but unintrusive. Thickness, grip, etc. are also exactly what you’d expect from a high-end mousepad-type mat. The table I put the mat on is fairly slick, and the mat grips solidly without being overly hard to roll up (a problem I have with my original F.A.T. Mat – the easiest way to roll it causes it to be hard to get into the sleeve). 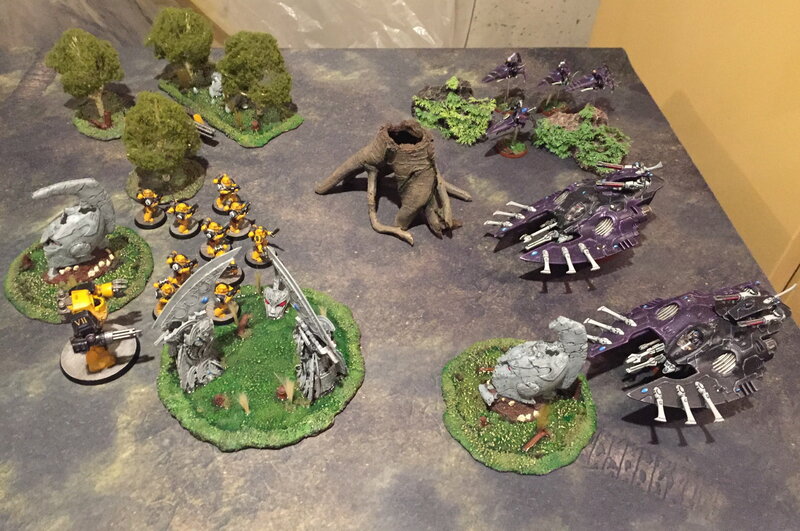 I think the best way to show these mats are in use, so I set up fairly dense themed terrain and squared off two available armies – a themed Eldar army that should match, and a somewhat contrasting Imperial Fists force. Someday I’ll manage to do my “40K Vietnam Aircav” list and both armies will match, but in this case, it’s the best you get. Subjective opinion is subjective, but I think it looks pretty good! Definitely better than the grey-white plastic table underneath. I was honestly a little worried when TableWar and Frontline parted ways – especially with how influential Frontline was at getting mats widely adopted for tournaments and events. I’m glad to see that Frontline’s attempt at producing their own mat has resulted in a quality product with some really solid and diverse designs that will work for a wide range of games, events, etc. 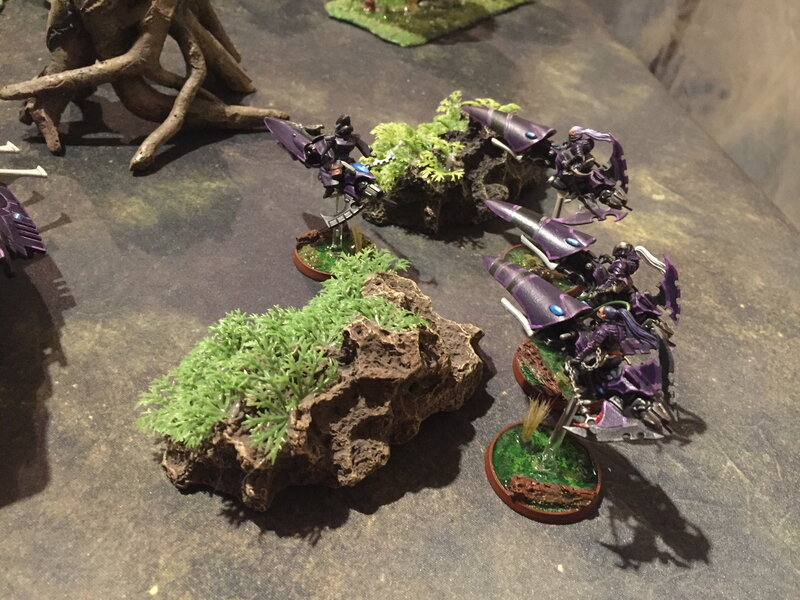 The Frontline mats sit in an interesting space – they’ve got some design elements that add interest to the surface you’re playing on, without having so many that the mat starts to feel like terrain (as with many Gamemat.eu’s offerings). At this point, gamers are really spoiled for choice. Find the design you want and go for it. Personally? 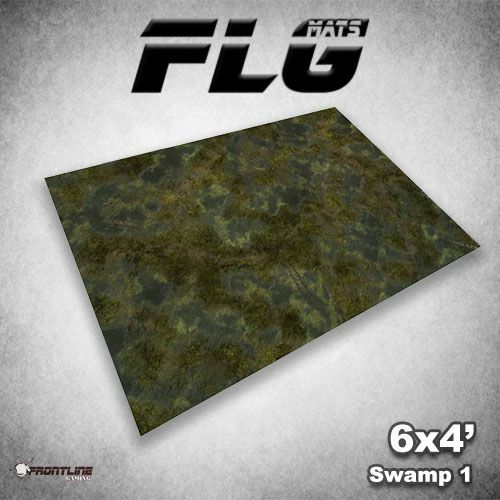 This swamp mat will be seeing a lot of use in the future. And with Frontline’s ambitions to add more designs and potentially even custom mats, I’ll be keeping my eye on them in the future. Rating: 9.5/10. Frontline Mats are available here. How dare you disparage my tables! But… since moving I have been keeping my eye open for an affordable mat, the $100 price tag post shipping is too much for me currently. Your tables are excellent, but they do 2d6 Impact Hits to unwary gamers.